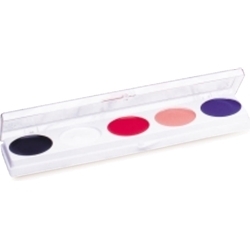 The original 5-color cream makeup palette was designed specifically to meet every clown's makeup requirements. It includes all the necessary colors for Whiteface, Auguste and Tramp/Hobo clowns. Colors Left to Right: Black, Clown White, Red, Auguste and Blue. Applications 4-6 full faces, 30-70 designs.